French Native Robin Ben Popeso came to USUE in pursuit to continue his soccer career. 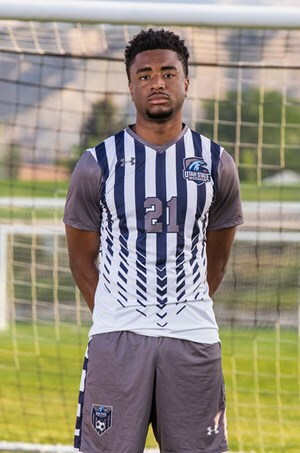 He first attended USUE in Fall 2017 after being impressed by the soccer program in Price. He felt as if he had a great opportunity to make something happen with his soccer career if he transferred. Popeso began his collegiate career at Malcom X College in Chicago, where he played a year of soccer and basketball. He saw opportunity in Price and decided to seize upon it. Having grown up with nine siblings, four girls and five boys, Popeso was hidden amongst the crowd. He grew up with an athletic mindset: “I was one of the more athletic.” Robin said. “whether it be basketball or soccer, I was always out doing something”. “At the age of nine, I stopped playing soccer and began to devote all of my time to basketball.” Both sports impacted his childhood leading up to college. Starting off playing both sports in College, Popeso narrowed down the option which he would pursue. The decision to pursue soccer was difficult but ended in a very orderly fashion. “I know my passion for soccer wasn’t stopping anytime soon,” Popeso said. “Basketball, I just never wanted to quit. I maintained playing by playing for the USUE intramural basketball team.” He played for both the Varsity USUE soccer team and the Reserve team and was an impactful player during the 2017-18 roster. In one season, Robin had a total of nine goals and six assists. Popeso had one teammate in particular he learned best from, Paulito Zarkin. “Paul is a roommate of mine and has been my best friend since day one.